Tickets go on sale Mon, Feb 11th for Season Members and Wed Feb 13th to General Public. 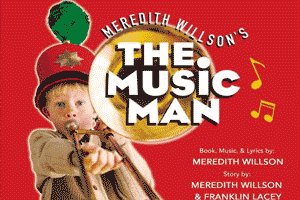 Audiences are sure to be dazzled and amazed by Meredith Willson’s six-time, Tony Award-winning musical comedy, The Music Man. This family-friendly musical follows fast-talking traveling salesman, Harold Hill, as he cons the people of River City, Iowa, into buying instruments and uniforms for a boy’s band.Despite the fact that “He doesn’t know one note from another!”.As with any great musical, Hill falls in love with the towns Piano Teacher Marian Paroo. Will Marian fall in love with Hill? Will Hill get away with his schemes? Join us this February and find out what happens to Hill and the stubborn people of River City, Iowa.